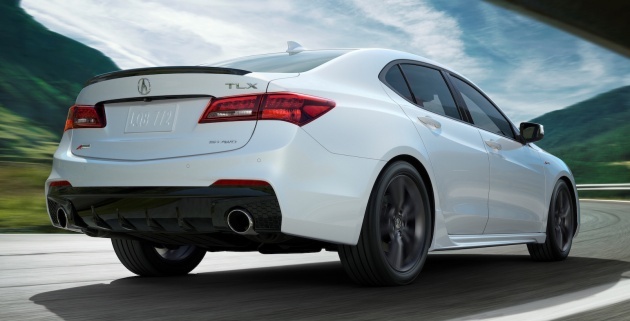 The Acura TLX has been give a midlife facelift exactly three years after it made its debut. 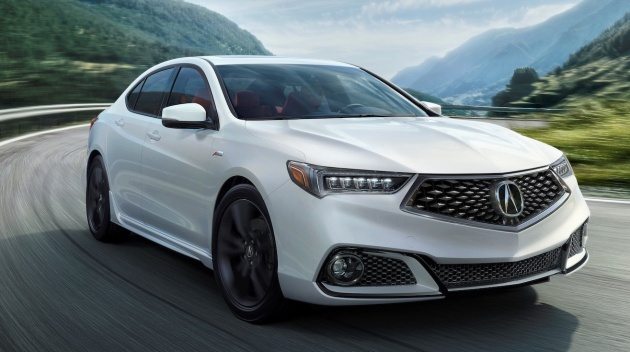 The TLX, which replaced both the smaller TSX (a rebadged Accord Euro) and the larger TL then, has been redesigned to follow Acura’s new “Precision Crafted Performance” design direction that has already influenced the latest MDX SUV. “We’ve really upped the ante in terms of styling, emotion and road presence, more effectively communicating the TLX’s dynamic capabilities,” said Jon Ikeda, Acura VP and GM. The 2018 TLX throws out the thick silver bar of old for a signature diamond pentagon grille accompanied by a new bumper and redesigned Jewel Eye headlamps. Paired with changes to the sedan’s stance, proportion, wheels and sheet metal (more sculpted hood and fenders), the TLX looks sportier and has more presence. V6 models add exposed rectangular exhaust tips, a rear diffuser and 18-inch wheels (from 17s on the 2.4L i-VTEC). Tick the Technology Package and you’ll get new chrome side sill garnish, seats with contrast piping and stitching, and power-operated thigh extension on the driver’s seat. The Advance Package includes trapezoidal LED fog lights, Surround View Camera, built-in wireless charging pad, white LED ambient light piping (10 locations throughout the cabin), a heated steering wheel, heated rear outboard seats, a body-colored decklid spoiler and power-folding side mirrors. Acura’s torque vectoring Super Handling All-Wheel Drive (SH-AWD) is available for the first time on all V6 models. It was previously available only with the add-on packs. There’s a new sporty TLX A-Spec with a unique front fascia, round LED fog lights, aggressive side sills, rear diffuser with large round pipes and a gloss black boot spoiler. Dark 19-inch rims complement a sport-tuned suspension with more aggressive damper settings and retuned EPS for sharper handling. A-Spec models with SH-AWD also receive a stiffer spring rate and rear stabiliser bar. A-Spec badging can be found at the back, fenders, side sill garnish and steering wheel. It’s the white car in these pics. Inside, the sporty one gets seats with bigger bolsters (choose between red leather as seen here, or black leather with Alcantara), red meter highlights, brushed aluminium-look trim and a thick-rimmed steering wheel. Enhancements borrowed from the Advance Package include the wireless charging pad, ventilated front seats and red LED ambient light piping (white on non A-Spec). The 2018 TLX is the first Acura to feature a refreshed dual-screen user On Demand Multi-Use Display (ODMD 2.0) interface that supports Apple CarPlay, Android Auto and Sirius XM 2.0. New software improves the response time and the menus are said to be more intuitive, for a 30% faster experience. The enhanced seven-inch touchscreen has a capacitive display that is more responsive to the touch. The AcuraWatch suite of safety tech includes Collision Mitigation Braking System (CMBS) with automatic emergency braking, Forward Collision Warning (FCW), Lane Keeping Assist (LKAS), Adaptive Cruise Control (ACC) with Low-Speed Follow (LSF) and Road Departure Mitigation (RDM). No engine details yet, but the outgoing pre-facelift car is powered by a 2.4 litre DOHC i-VTEC with 206 hp/247 Nm (eight-speed DCT) and a 3.5 litre SOHC i-VTEC V6 with 290 hp, 362 Nm and a nine-speed automatic. The 2018 TLX is slated to go on sale in North America in June. Check out the ads, which milks the NSX to the max. An acquired taste. Difficult to understand how Acura or Honda bosses can approved such monstrosity! is it honda new trend of dissing gear knob and replace it with electronic button ? Isn’t Honda going to re launch the Legend?